This Friday's theme was "work". This word has lingered over my head in various and sundry forms for the past several years as I am a stay-at-home-mom. It is often assumed that I don't work ya'll. I get asked alllllll (can I add more l's?) the time "Really? What do you do?" I chuckle inwardly and answer to the best of my ability, that I work in the home with my children. What does this work look like? For me it's taking children to school, field trips, doctors/dentist appointments, homework, enrichment (academic and otherwise), feeding (and nourishing) them, and finding loving ways to shape their beautiful little characters. As my five minutes are already up (that goes by so fast), I will end on this. Work means different things to different people and for me, in this season, work is raising children. It is one of the things I put my heart, mind, strength, spirituality, and whole life into. So even though at times is it hard work, it isn't really work at all. 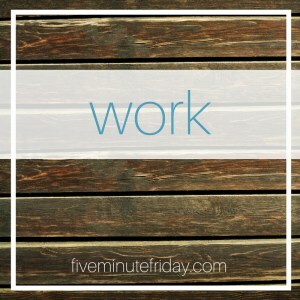 Stay tuned for next week's five minute Friday link up! Join the conversation here.